YOU WILL BRING THE BLIND BY A WAY I DO NOT KNOW-AND I WILLINGLY GO- THANK YOU JESUS! JESUS, HOLD ME CLOSER-IN EVERY MINTUE OF EVERY HOUR-I FEEL THE POWER OF YOUR LOVE! my HOPE is that by sharing what the Spirit of The Lord has taught me, that Your life will be enriched and that you will be strengthened and encouraged to continue this good fight of faith that we have all been called to be. In the name of our LORD, Amen. Day after day the Spirit of the Lord comes to cheer me-to give me His Joy and a New Courage that is the impetus for my carrying on in this privilege-this honor of working for Him. He inspires me with His promises for my present and future days. He helps me, cheering me through all obstacles and any unbelief just as He did for the first followers that loved Him. 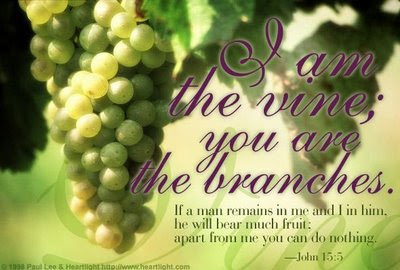 How I cling to the VINE that is connected to the ROOT of our Fathers love. As I dwell in Him and taste of His beauty I am refreshed, restored, re-filled till I overflow with His goodness. I know that my Lord expects good things of me (and you) and that He is Ever Ready to Help me to achieve them! TEACH ME MY LORD-SO I WILL LEARN! The Lord our God is our friend, our comforter, our provider, our Teacher. He explains to us that we are to learn and be trained not by life’s difficulties and trials as much as by the times that we withdraw to be alone with Him. Difficulties and trials alone are not of total Spiritual value for our learning. Daily contact with Him is the Only Way to gain Spiritual value—which provides All of what we need to Grow Through and from the difficulties and trials that we face. When we share with our Father our Joys, sorrows, and difficulties, this will provide a great Spiritual value for us to LEARN from. To grow from within—this allows King Jesus to Rule His Kingdom—that lives within us. Our hearts and spirits are His Kingdom. “To Share with Him” means to Include Him in on all the areas of our life- Our good days and the not so good days. Are you having a celebration—Invite Jesus! Are you having a bad day and nothing seems to be going right—Invite Jesus! Our living with God on a daily basis does not give us immunity from difficulties, but our living with Him gives Him the right to Add into our days of difficulty- His Peace. As we give to Him—He claims all things—Joyful things and troubles-then He works it all out and He also accepts everything that we bring to Him which is in need of His help that we need. All of the Spiritual values that we require can Only be gained by sharing with Him everything at every moment. He encourages us to SHARE All with Him. He has called us His friend and true friends share everything together. We must remember, that a True friendship is based on sharing and trust and is Mutually given. As we share with Him-He shares with us in Ever-Increasing Measure with those who Wholly share with Him. Within His Ever-Increasing Measure is His Love, His Grace, His Joy, His Secrets, His Power and His manifold Blessings—This He shares all day every day to those that He abides in and who abide in Him. Yea, Amen. My thanksgiving do i offer to Your abiding in me, my Lord. I am humbly grateful my Lord to know that because I abide in You and You in me; that YOU are able and willing to keep me from stumbling or falling and to present me blameless and faultless before YOUR presence. WAIT! - HE WILL MAKE A WAY! "I HAVE THE AUDACITY TO BELIEVE..."
OH MY GOODNESS-GOD HAS DONE IT AGAIN! OH MY LORD, COME BY HERE!